Throughout the country's stormy history - from the Roman period through the present – Jews have lived in France, their fate intimately tied to the various kings and leaders. Despite physical hardship and anti-Semitism, Jewish intellectual and spiritual life flourished, producing some of the most famous Jewish rabbis and thinkers, including Rashi and Rabenu Tam. Jews have contributed to all aspects of French culture and society and have excelled in finance, medicine, theater and literature. Currently, France hosts Europe’s largest Jewish community - 480,000 strong – and Paris is said to have more kosher restaurants than even New York City. Between January and November 2015, 6,500 French Jews made aliyah, and thousands more are predicted to make their way to Israel by the new year. A Jewish presence existed in France during the Roman period, but the community mainly consisted of isolated individuals, rather than an established community. After the Roman conquest of Jerusalem, boats filled with Jewish captives landed in Bordeaux, Arles and Lyons. Archeological finds of Jewish objects with menorahs imprinted on them date back to the first through fifth century. Jewish communities have been documented in 465 in Vannes (Brittany), in 524 in Valence and in 533 in Orleans. Jewish immigration increased during this period and attempts were made to convert the Jews to Christianity. In the 6th century, a Jewish community thrived in Paris. A synagogue was built on the Ile de la Cite, but was later torn down and a church was erected instead. Anti-Jewish sentiments were not common in this early period, in fact, after a Jewish man was killed in Paris in the 7th century, a Christian mob avenged his death. The First Crusade (1096-99) had no immediate effect on the Jews of France, however, in Rouen, statements were made by the Crusaders justifying their persecution of Jews across Europe. After the Second Crusade (1147-49), a long period of persecution began. French clergyman gave frequent anti-Semitic sermons. In some cities, such as Beziers, Jews were forced to pay a special tax every Palm Sunday. In Toulouse, Jewish representatives had to go to the cathedral on a weekly basis to have their ears boxed, as a reminder of their guilt. France’s first blood libel took place in Blois in 1171 and 31 Jews were burned on the stake. The situation detiorated during the rule of King Philip Augustus. Philip was raised believing that Jews killed Christians and, therefore, held an ingrained hatred toward the Jews. After four months in power, Philip imprisoned all the Jews in his lands and demanded a ransom for their release. In 1181, he annulled all loans made by Jews to Christians and took a percentage for himself. A year later, he confiscated all Jewish property and expelled the Jews from Paris; he readmitted them in 1198, only after another ransom was paid and a taxation scheme was set up to procure funds for himself. In 1215, the Fourth Lateran Council forced Jews to wear a badge in the provinces of Languedoc, Normandy and Provence. More anti-Jewish persecutions took place in the western provinces during the rule of Louis IX (1226-70). In 1236, crusaders attacked the Jewish communities of Anjou and Poitou and tried to baptize all the Jews, those that resisted were killed. An estimated 3,000 Jews were murdered. In 1240, Jews were expelled from Brittany and the famous disputation of the Talmud began in Paris. The Talmud was put on trial and was subsequently burned in 1242. Despite the persecution, Jews managed to remain active in money-lending and commerce. Jews expelled from England were also admitted into France. Again, in 1254, Jews were banished from France, their property and synagogues were confiscated, however, after a couple of years, they were readmitted. Phillip IV the Fair ascended to power in 1285. In 1305, he imprisoned all the Jews and seized everything they owned except the clothing on their backs. He expelled 100,000 Jews from France and allowed them to travel with only ones day’s provisions. Phillip IV’s successor, Louis X, allowed the Jews to return in 1315. A Jewish presence was first mentioned in Besancon, in eastern France, in 1245. Jews left the town in the 15th century, and returned only after the French Revolution. Jews were first permitted to reside in Belfort, the capital of the Belfort region in eastern France, in the 1300s. By the time of the Nazi occupation there were 700 Jews in the town, of which 245 were killed. Between 1338-1347, 25 Jewish communities in Alsace were victims of terror. Massacres in response to the Black Plague (1348-49) struck Jewish communities throughout the east and southeast. The Jews of Avignon and Comtat Venaissin were spared similar fates because of intervention from the pope. Further bloodshed spread to Paris and Nantes in 1380. The culmination of all the persecution and bloodshed was the definitive expulsion of Jews from France in 1394. Despite all the expulsions and persecutions, Jewish learning managed to thrive during the middle ages. Both Il-de-France and Champagne became centers for Jewish scholarship and other centers of learning grew in the Loir Valley, Languedoc and Province. In the north, talmudic and biblical commentary, as well as, anti-Christian polemic and liturgical poetry were studied. Whereas, in the south, grammar, linguistics, philosophy and science were studied. Also, in the South, numerous translations were made of religious materials from Arabic and from Latin to French. One of the foremost Jewish scholars during the Middle Ages was Rashi, who started his own yeshiva in France. His biblical commentary is one of the most popular and widely known works today. Large numbers of Marranos, secret Jews, from Portugal came to France in the mid-1500's. The majority of them did not remain faithful to Judaism and assimilated into French society. This was the first time since 1394 when Jews were allowed to legally live in the kingdom of France. After the Chmeilnicki massacres in 1648, more Jewish settlers, fleeing the Ukraine and Poland, came to Alsace and Lorraine. An influx of immigrants came to southeast France, when the Duke of Savoy issued an edict declaring Nice and Villefranche de-Conflent free ports. The communities of Avignon and Comtat Venaissin flourished in the 17th century. Jews became involved in commercial activity and frequently attended the fairs and markets. Success spread to other nearby communities; including the Jewish community of Alsace, who exploited the facilities given to the Marranos, "Portugese Jews." Jews began resettling Paris in the 18th century. Two groups of Jews came to Paris: southern Jews mainly of Sephardic descent from Bordeaux, Avignon and Comtat Venaissin and Ashkenazim from Alsace, Lorraine and a couple other northern cities. The wealthier Sephardim settled on the Left Bank, while the Ashkenazim settled on the Right. Paris’s first kosher inn opened in 1721 and its first synagogue opened in 1788. Anti-Jewish laws began to be repealed in the 1780's, such as the "body tax" which likened Jews to cattle. About 500 Jews were living in Paris and about 40,000 in France at the time of the French Revolution. After the French Revolution, citizenship was finally granted to the Jews of France. The Sephardim received citizenship in September 1790 and the Ashkenazim received it about six month later. Jews were given civic rights as individuals, but lost their group privileges. During the Reign of Terror (1793-94), synagogues and communal organizations were closed down, along with other religious institutions. Napoleon considered the Jews, "a nation with a nation," and he decided to create a Jewish communal structure sanctioned by the state. Hence, in 1806, he ordered the convening of a Grand Sanhedrin, composed of 45 rabbis and 26 laymen. The Grand Sanhedrin paved the way for the formation of the consistorial system, which were religious bodies established in every department of France that had a Jewish population numbering more than 2,000. The consistorial system made Judaism a recognized religion and placed it under government control. Despite the new found freedoms, anti-Jewish measures were passed in 1808. Napoleon declared all debts with Jews annulled, reduced or postponed, which caused the near ruin of the Jewish community. Restrictions were also placed on where Jews could live in an effort to assimilate them into French society. The Jews did not receive the Restoration with any hostility. Jewish educational institutions were be established. In 1818, schools were opened in Metz, Strasbourg and Colmar. Other Jewish schools were opened in Bordeaux and Paris. The Metz Yeshiva, which was closed during the Revolution, was reopened as a central rabbinical seminary. The seminary was transferred to Paris in 1859, where it continues to function today. Judaism was given the same status as other recognized religions. During the 19th century, Jews were extremely active in many spheres of French society. Rachel and Sarah Bernhardt are two Jewish women who became famous acting at the Comedie Francaise in Paris. Bernhardt eventually directed plays at her own theater and was given the title "Divine Sarah" by Victor Hugo. Jews became involved in politics; for example, Achille Fould and Isaac Cremiuex served in the Chamber of Deputies. Jews also excelled in the financial sphere, two leading families were the Rothschild and the Pereire families. In the field of literature and philosophy, well-known Jews included Emile Durkheim, Marcel Proust and Salomon Munk. While the situation improved for Jews in France, the Damascus Affair served as a rude awakening. Accusation of a blood libel in Damascus led to an outbreak of anti-Jewish disorders in France in 1848. General unrest led to attacks in Alsace and spread northward, Jewish houses were pillaged and the army had to be sent in to resume order. The 1870 war transferred the Jewish communities of Alsace and Lorraine from French control to German control, a major loss for the Jewish community. An upsurge of anti-Semitism began in the late 1800's. Anti-Semitic newspapers were circulated, including Edouard Drumont’s La France Juive (1886), which became a best-seller. Jews were blamed for the collapse of the Union Generale, a leading Catholic bank. In this atmosphere, the infamous Dreyfus case was tried. Captain Alfred Dreyfus was arrested on October 15, 1894, for spying for Germany. He received a life sentence on Devil’s Island off the coast of South America. The government chose to repress evidence, which came to light through the writings of Emile Zola and Jean Jaures. Ten years later, the French government fell and Dreyfus was declared innocent. The Dreyfus case shocked Jewry worldwide and motivated Theodor Herzl to write the book "The Jewish State: A Modern Solution to the Jewish Question" in 1896. The Dreyfus case also led to the French law in 1905 separating church and state. At the turn of the century, Jewish artists were extremely prominent, including Modigliani, Soutine, Kisling, Pisarro and Chagall. France faced an increase in Jewish immigration in the early 1900's. More than 25,000 Jews came to France between 1881 and 1914. Immigrants hailed from all over Europe and the Ottoman Empire. Although, for many of the immigrants, France served as a transit point rather than a final destination. The advent of World War I halted Jewish immigration and also put an end to anti-Semitic campaigns because of the need for a unified front. France was able to regain Alsace and Lorraine and many Jewish families were able to reunite once Alsace and Lorraine became part of France. During the inter-war years, Jewish immigration from North Africa, Turkey and Greece increased once again. Immigration from Eastern Europe also skyrocketed, many came after the pogroms in the Ukraine and Poland. The trend continued especially after the United States prohibited free immigration in 1924. The Federation des Societes Juif de France (FSJF) was established in 1923 to take care of the needs of the French Jewish community. The Germans invaded France on May 10, 1940, and Paris fell on June 14th. Two weeks later the armistice was signed and France was divided into unoccupied and occupied zones, and Alsace-Lorraine was annexed to the Reich. A Vichy government was set up in France. An estimated 300,000 Jews lived in France prior to the invasion. Until the German occupation of France in 1940, no roundup of Jews would have been possible because no census listing religions had been taken in France since 1874. A German ordinance on September 21, 1940, however, forced Jewish people of the occupied zone to register at a police station. These files were then given to the Gestapo. Between September 1940 and June 1942, a number of anti-Jewish measures were passed, including expanding the category of who is a Jew, forbidding free negotiation of Jewish-owned capital, confiscating radios in Jewish possession, executing and deporting Jewish members of the resistance movement, establishing a curfew, forbidding a change of residence, ordering all Jews to wear a yellow badge and prohibiting access to public area. The Vichy government established a Commissariat General aux Questions Juives in April 1941 that worked with German authorities to aryanize Jewish businesses in the occupied zone. French Jewry was represented in the Union Generale des Israelites de France (UGIF) during the occupation. Non-French Jews living in France were treated differently than French Jews during this period. Non-French Jews were rounded up for deportation by the French police, whereas French Jews were rounded up by the Gestapo, who did not trust the French authorities to do so. In March 1942, the first convoy of 1,112 Jews was deported to concentration camps in Poland and Germany. Beginning at 4:00 a.m. on July 16, 1942, 13,152 Jews were arrested, including 5,802 (44%) women and 4,051 (31%) children. The Vel’ d’Hiv roundup, codenamed Opération Vent Printanier (“Operation Spring Breeze”), was one of several Nazi-directed raids carried out by the French police aimed at eradicating the Jewish population in France. The name is derived from the nickname of the bicycle velodrome and stadium where a majority of the victims were temporarily confined. Others were sent to the Drancy, Pithiviers, and Beaune-la-Rolande internment camps. All were subsequently transported in cattle cars to Auschwitz for their mass murder. The Jews could take only a blanket, a sweater, a pair of shoes and two shirts with them. Most families were split up and never reunited. The roundup accounted for more than one-quarter of the 42,000 Jews sent from France to Auschwitz in 1942, of whom only 811 returned to France at the end of the war. Another notorious round-up occurred on August 15, 1942, when 7,000 foreign Jews were arrested and handed over to the Germans. Between 1942 and July 1944, nearly 76,00 Jews were deported to concentration camps in the East via French transit camps, only 2,500 returned. Of those deported, 23,000 had French nationality, the rest were "stateless." France’s major transit camp, Drancy, located outside Paris, was established in 1941. A number of other transit camps were created throughout France and were run by the French police. Drancy was designed to hold 700 people, but at its peak in 1940 it held more than 7,000. Drancy served as a stopping point for thousands of Jews en route Auschwitz. 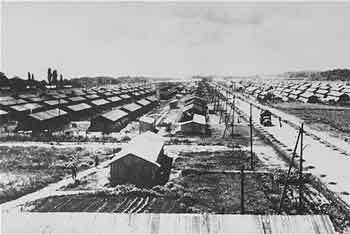 There were also concentration camps located inside France, such as Gurs, which opened in June 1940. By 1941, it housed about 15,000 inmates, including foreign Jews; many perished there from malnutrition and bad sanitation. More than 3,000 Jews died in these internment camps. When Germany occupied all of France in late 1942, most of the inmates were sent to concentration camps in Germany and Poland. After the deportations ended in mid-1943, only 1,200 prisoners remained. It is estimated that 25 percent of French Jewry died in the Holocaust. The Vichy minister responsible for ordering the deportations, Pierre Laval, was tried in 1945 and found guilty of treason. He tried to commit suicide by swallowing a cyanide capsule, but was revived by doctors, and later executed by firing squad on October 15. The head of the General Commission to Jewish Affairs, Louis Darquier was sentenced to death in absentia in 1947 for collaboration, but escaped to Spain, which refused to extradite him. He died in near Málaga, Spain in 1980. René Bousquet, secretary-general of the national police, who planned the raid with Darquier, was acquitted of “compromising the interests of the national defense,” but found guilty for his involvement in the Vichy government. He did not serve any time in prison and later became involved in politics. In 1989, he was accused of crimes against humanity for the deportation of 194 children. In 1993, before coming to trial, Bousquet was killed by a 55-year-old mental patient named Christian Didier. Émile Hennequin, head of Paris police, was condemned to eight years’ penal labor in June 1947. Helmut Knochen of the SS was sentenced to death by a British Military Tribunal in 1946 for the murder of British pilots. The sentence was never carried out. He was extradited to France in 1954 and again sentenced to death. The sentence was later commuted to life imprisonment. In 1962, the president, Charles de Gaulle, pardoned him and he was sent back to Germany, where he retired to Baden-Baden and died in 2003. Theodor Dannecker, the SS captain head of the German police in France, was interned by the United States Army in December 1945 and a few days later committed suicide. France became a haven for postwar refugees and within 25 years its Jewish population tripled. In 1945, 180,000 Jews were living in France, and, by 1951, the population reached 250,000. An influx of North African Jews immigrated to France in the 1950's due to the decline of the French empire. Subsequent waves of immigration followed the Six-Day War, when another 16,000 Moroccan and Tunisian Jews settled in France. Hence, by 1968, Sephardic Jews were the majority in France. These new immigrants were already culturally French and needed little time to adjust to French society. Two of the major problems facing French Jewry are assimilation and anti-Semitism. Anti-Semitism has been present throughout France’s post-war history. After the Six Day War in 1967, anti-Israel stances were taken by de Gaulle and his government. Anti-Israel propaganda was published in May 1968 by the New Left and supporters of Palestinian terrorism; a number of physical clashes broke out between Jews and Arabs in certain quarters of Paris. This atmosphere led to increased aliyah of French and Algerian Jews in the late 1960's. 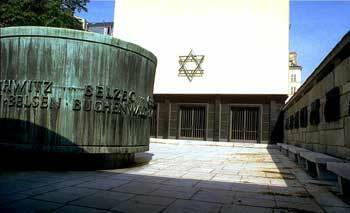 In the late 70's, a spate of racist and anti-Semitic attacks were carried out against Jewish monuments and cemeteries. On October 3, 1980, a bomb exploded outside a Paris synagogue, killing four people. Terrorism and anti-Semitism continued to be a problem in the 1980's and 90's, as many synagogues, cemeteries and restaurants were vandalized and desecrated. Few of the perpetrators have been apprehended. In the late 1990's, Jews were concerned about the rise to power of the National Front political party, who espouses anti-immigration and anti-Semitic views. Besides for problems with anti-Semitism, France has had difficulty owning up to its role in the Holocaust. It has taken many years to apprehend and try French war criminals. In the 1980’s, a trial was held against Klaus Barbie, who received a sentence of life imprisonment. In 1994, Paul Touvie, who was responsible for the massacre of seven Jews in Lyon during World War II, was tried and condemned to life in prison. A third trial, in 1997, tried Maurice Papon, a senior official responsible for Jewish affairs in Bordeaux. Papon’s trial was different than the other two because the other two were killers, whereas Papon was a bureaucrat, who signed the death warrants for 1,560 French Jews, including 223 children. Papon was found guilty for crimes against humanity and was sentences to ten years in jail. The trial served as a pretext for reexamining France’s role in the Holocaust. Debate arose about the Vichy regime’s involvement in rounding up, deporting and murdering French Jews. Restitution for stolen era artwork from France is another issue of controversy. In 1998, France finally created a centralized body to investigate Holocaust restitution cases for heirs and descendants of those whose property was confiscated during World War II. France’s national museum is trying to track down the owners or heirs to more than 2,000 pieces of unclaimed artwork in its possession. It is estimated that over 100,000 pieces of artwork were taken from Jews and others in France alone; Jewish art collections in France were among those coveted by the Nazis. On December 11, 2005, a memorial to 86 Jewish victims of Nazi physician August Hirt was unveiled at the Jewish cemetery in Cronenbourg. A Holocaust memorial museum was opened in 2012. It provides details of the persecution of the Jews in France and many personal mementos of inmates before their deportation to Auschwitz. A memorial was also constructed in 1976 at the site of the Drancy internment camp. A railway wagon used to carry internees to Auschwitz and is also displayed at Drancy. Today more than 600,000 Jews live in France, 375,000 live in Paris. There are 230 Jewish communities, including Paris, Marseilles (70,000), Lyons (25,000), Toulouse, Nice and Strasbourg. The Consistoire Central Israelite de France et d’Algerie, reopened following the war. The Consistoire is responsible for training and appointing rabbis, religious instruction for youth, kashrut supervision and the application of Jewish law in personal matters. The Consistoire mainly represents Orthodox synagogues and so a number of liberal synagogues fall outside its jurisdiction. Another major organization, the Conseil Representaif des Juifs de France (CRIF) was founded in 1944 and today it is comprised of 27 Jewish organizations, from Zionist to socialist. Since 1945, it has played a significant role in the fight against anti-Semitism. The major Jewish community organization is the Fods Social Juif Unife (FSJU), which was founded in 1949. It is involved in social, cultural and educational enterprises, as well as fundraising. The FSJU"s community centers played a large role in the absorption process of new Jewish immigrants. Only 40 percent of French Jewry are associated with one of these community bodies. It is also estimated that only 15 percent of French Jews go to synagogue. Still Jewish life and culture is flourishing. There are more than 40 Jewish weekly and monthly publications, as well as numerous Jewish youth movements and organizations. Most French Jews send their children to public schools, although there is increased attendance in Hebrew day schools; today close to 25% of school-age children attend full-time Jewish schools. In Paris alone, there are 20 Jewish schools in the day school system. Hebrew is also being offered as a foreign language in many state high schools. In 1985, a new library sponsored by the Alliance Israelite Universelle (AIU) opened. It is now the largest Jewish library in Europe. During the 1980's, there was a rise in the number of ultra-Orthodox Jews in France, especially Paris. The Lubavitch movement has done a lot of outreach work in France, putting up bill-boards during the holiday periods and holding public candle-lighting ceremonies on Chanukah. There is also a bilingual English speaking community in Paris called Kehilat Gesher. Kehilat Gesher, a community of around 145 families, is the only French Anglophone liberal synagogue serving the greater Paris area, through two locations, Paris 17th and St-Germain-en-Laye. The best high schools in France are Jewish schools, according to a comprehensive report ranking all of France's 4,300 high schools released in April 2015 by Le Parisien Daily. The Beth Hanna high school, part of France's Chabad Lubavitch school network, was ranked as the top school in the entire country, due to their impressive 99% success rate on matriculation exams. Jewish high school The Lycee Alliance was also ranked highly on the list. Many lists from other reputable sources including Le Figaro ranked the Jewish schools as some of the top-performing schools in the country. Over 20,000 French Jews made aliyah to Israel between 2000 and 2015, according to the Jewish Agency. In 2014, a record number of 7,200 French Jews emigrated to Israel to seek a better life. Between January and July 2015, 4,260 French immigrants made their way to Israel, compared to 3,830 French immigrants during the same period the previous year. The first French Jews to make aliyah to Israel following November 13, 2015's coordinated terror attack on Paris, arrived on November 16, 2015. A group of 52 Jews from France landed at Israel's Ben-Gurion airport on November 16, and “dozens more” were expected to follow within the week, a spokesman for the Jewish Agency stated upon their arrival. French Jews fleeing anti-Semitism and terror attacks have also increasingly chosen Britain as their new home. Israel welcomed 7,054 French Jews making Aliyah in 2015, while 5,000 French Jews made the move to Britain. For many years following the Holocaust, anti-Semitism in France was only a mild problem, but in the late 2000's the Jewish Community Protection Services reported a strong surge in anti-Semitic incidents and attacks. From 2008 to 2010 there was a nearly 75 percent increase in anti-Semitic incidents, many attributed to anger over Israel's Operation Cast Lead in the Gaza Strip and the ongoing conflict with the Palestinians. Violence in France, especially directed at Jews, has been primarily perpetrated by Muslims. An estimated eight million Muslims live in France, compared to fewer than 500,000 Jews, and a large segment of that Muslim population has not successfully integrated into French society. Some came with radical views and others have become more extreme as a result of contact with Islamists inside and outside of France. In 2011, an estimated 389 incidents of anti-Semitism were reported, and the severity of the threat to Jews grew to the point where Jews were discouraged from wearing clothes or jewelery or anything that might identify them as Jews. The entire French nation was traumatized on January 7, 2015, when two Islamic extremists attacked a French satirical newspaper that had published cartoons of the Prophet Muhammad, killing 10 members of the staff and two police officers. Two days later, while the perpetrators of the Charlie Hebdo massacre were surrounded by police, an assailant believed to have killed a policewoman the day before, took hostages at a Kosher supermarket in eastern Paris. After murdering four of the hostages, the suspect was killed when police stormed the market. During the siege, Jewish schools and shops in the neighborhood were closed and, for the first time since World War II, the Grand Synagogue of Paris was closed for Friday prayers. Three soldiers patrolling outside of a Jewish Community Center in Nice, Southern France, were attacked by an individual weilding a knife on February 3, 2015. The attacker was identified as 30 year old Mousa Coulibaly (no relation to the Kosher supermarket gunman Ahmed Coulibaly), and had apparently been expelled from Turkey during the previous week. Earlier that afternoon he had been riding on a tram in France when he was approached by a tram employee and could not produce a ticket. He was forced off of the train at the next stop, where he became irate and targetted the soldiers, slashing one soldier on the cheek, a second soldier on one of their legs, and a third soldier on the chin. He flew to Turkey on January 28 with a one-way ticket, which raised suspiscions with French authorities who asked the Turkish government to send him back. On November 13, 2015, terrorists affiliated with the Islamic State carried out a planned and coordinated terror attack on seven separate targets in Paris, France. The first attack occured at the Stade de France, the country's national sports stadium. At a friendly football match (not played for rank) between France and Germany attended by French President Francois Hollande, a bomber detonated himself outside of the stadium at 9:20pm local time after his explosive vest was discovered by a venue security gaurd. A second bomber did not attempt to enter the stadium, and detonated himself a few moments after the first explosion. It is a popular practice for fans to light fire-crackers during the games, so the crowd was not dispersed and the teams kept playing folowing the initial explosions. President Hollande was evacuated immediately, and once security inside the stadium realized what was happening they stopped the game and had the fans come down onto the field. A third bomber detonated himself at a McDonalds restaurant close to the stadium thirty-three minutes after the second stadium bomber detonated. At 9:20 p.m., almost simultaneous with the first suicide bomb detonation at the Stade de France, attackers opened fire at people eating dinner at Le Carillon cafe and Le Petit Cambodge on streets rue Bichat and rue Alibert. The assailants fled in two vehicles following the attack, in which they killed eleven people. Twelve minutes after the start of this attack, at 9:32pm, an attacker opened fire on the Cafe Bonne Biere killing five and injuring eight. Four minutes later, at nearby restaurant La Belle Equipe, multiple terrorists opened fire killing nineteen and injuring nine before fleeing in vehicles. At 9:40pm a suicide bomber was seated at the Comptoir Voltaire cafe, and placed an order before detonating his explosives killing himself and seriously injuring fifteen. U.S. blues-rock band The Eagles of Death Metal were playing a sold-out show at the Bataclan theater on Boulevard Voltaire, when at approximately 9:45pm three men dressed in all-black toting AK-47 assault rifles entered the concert hall. Shouts of “Allahu Akbar” were heard and the gunmen started firing calmly into the crowd. Some concert-goers initially mistook the machine-gun fire for pyrotechnics, but it soon became clear that they were in danger. The initial attack lasted for 10-20 minutes, with the attackers re-loading three or four times each while lobbing grenades into the frenzied crowd. Band members managed to escape the theater soon after the attack began, but some of their crew members were killed. The attackers began to round up a group of 60-100 hostages at 11:00pm, and shortly after midnight French police launched an assault on the Bataclan theater. Two terrorists detonated their suicide vests when police stormed the building, one was shot by police, and one escaped. Eighty-seven people were killed by the terrorists at the Bataclan theater. Syrian and Egyptian passports were found on the bodies of the attackers, but these proved to be fake. In total these attacks killed 129 people and injured over 350. A state of emergency was declared in France by President Hollande in the days after the attack, which was then extended until the beginning of 2016. The French army carried out it's largest air strikes on ISIS yet on November 15, 2015, dropping 20 bombs on the self-proclaimed capital in Raqqa. Hollande vowed to “mercilessly,” fight terrorism while on a visit to the Bataclan theater after the attacks. During the first half of 2015, there was an 84% increase in anti-Semitic attacks compared with the same period the previous year. Although Jews make up less than 1% of France's population, more than 50% of all reported racist attacks in France in 2015 were perpetrated against Jews. A Rabbi and his son were attacked outside of a synagogue in Marseille in mid-October 2015. In an interview after the fact, the Rabbi clafiried details about the attack, for example the attacker was allegedly drunk and stumbling. A Jewish school teacher in Marseille, France, was stabbed multiple times by youths professing allegiance to the Islamic State on November 18, 2015. Three teenagers, one wearing a shirt bearing the symbol of ISIS, approached the teacher on the street and taunted, insulted, and finally stabbed the victim three times before being chased away by a car. Seventy-three year-old French Jewish politician Alain Ghozland was found dead in his apartment from multiple stab wounds on January 12, 2016. It appeared that his apartment had also been robbed. The increasingly hostile environment, combined with the economic problems in France, prompted a significant jump in immigration to Israel. After averaging roughly 2,000 emigres per year for the previous several years, 7,200 French Jews moved to Israel in 2014, and 7,900 made the move in 2015. Still, with nearly 500,000 Jewish residents, France remains the Diaspora's second-largest (after the United States) Jewish community. On April 4, 2017, 65-year old Jewish mother Sarah Halimi was assaulted in her third-floor apartment by a 27-year old neighbor of hers, Kobili Traoré. Traoré was mentally unstable and fighting with his family, when he gained access to a neighboring apartment and climbed out of their balcony up to Halimi's apartment. There, he badly beat her and threw her out of her third-story window to her death. Traoré shouted arabic slogans while beating Halimi, who was the only Jewish resident of the building. A memorial to young victims of the Holocaust in Lyon, France was smashed by vandals in August 2017. French President Emanuel Macron denounced the perpetrators as shameful and cowardly, and local Jewish groups committed to rebuilding the memorial. Paris Mayor Anne Hidalgo said during her address at the CRIF event that “anti-Semitism, which cloaks itself as anti-Zionism, must never be allowed to succeed.” She said her city opposes the Boycott, Divestment and Sanctions movement against Israel, whose promotion is illegal in France and is considered incitement to discrimination or racial hate. Jewish Holocaust survivor Mireille Knoll was murdered in her Paris apartment on March 24, 2018, in what French authorities deemed a religiously-motivated hate crime. The 85-year old victim had been stabbed to death and badly burned when the attackers apparently tried to set fire to her apartment. Two suspects were arrested in the days following the brutal attack, including one of Knoll's young neighbors who had apparently known her well. Knoll's death inspired a rally against anti-Semitism on the street of Paris the following week. A statement condemning anti-Semitism signed by over 250 prominent French figures was released by Le Parisien on April 22, 2018. The statement, drafted by a former editor of the Charlie Hebdo magazine, specifically draws connections between France's Muslim minority population and recent anti-Semitic activity in the country. A group of 30 influential French Imams issued a harsh condemnation of recent anti-Semitism and Islamic terrorism during the same week. In the letter, published in the French daily Le Monde, the Muslim leaders derided the confiscation of our religion by criminals. Approximately 40% of all violent acts in France classified as racially or religiously motivated during 2017 were perpetrated against Jews, and anti-Semitic acts reported in France saw a 20% increase from 2016 to 2017. Anti-Semitic acts rose by 74 percent in 2018, increasing from 311 to 541. At the beginning of 2019, there were already a rash of incidents. In February, for example, a tree planted in the Paris suburb of Sainte-Genevieve-du-Bois in memory of Ilan Halimi, a young man who in 2006 was kidnapped and tortured because a gang thought his Jewish family had a lot of money to pay ransom, was chopped down. Artwork on two Paris post boxes showing the image of Simone Veil, a Holocaust survivor and former magistrate, was defaced with swastikas, while a bagel shop was sprayed with the word “Juden,” German for Jews, in yellow letters. The public was particularly outraged when protestors were filmed hurling abuse on February 16, 2019, at Alain Finkielkraut, a well-known Jewish writer and son of a Holocaust survivor. Demonstrations were also held in cities from Lille in the north to Toulouse and Marseille in the south. One reason for the demonstrations was an increasing number of anti-Semitic incidents by “yellow vest” protesters, so called because of the color of vests worn by people objecting to rising fuel prices, the high cost of living, and claims that a disproportionate burden of the government’s tax reforms were falling on the working and middle classes. In response to the upsurge of violence, Macron said that France needed to draw “new red lines” against intolerance and announced plans for a bill to combat online hate speech. He also called for the dissolution of three extremist right-wing groups. France and Israel have maintained relations since before the founding of the state. Strong contacts between the Yishuv and the Free French existed in the period before the War of Independence; France gave moral and financial support to the illegal immigrants of Palestine. In 1947, France supported the UN partition plan, but normalization between the two countries was gradual. Cooperation between France and Israel was at its height during the Sinai campaign in 1956 and afterward until the Six-Day War in 1967. During this period, France became one of Israel’s main arms suppliers and a network of technical and scientific cooperation were established. A cultural agreement was signed between France and Israel in 1959, establishing French language and literature classes at Israeli universities and Hebrew language instruction at French universities. After De Gaulle came to power in 1958, France began reconsidering its Middle East policy. Franco-Israeli relations detiorated after the Six-Day War when De Gaulle imposed an arms embargo against Israel and supported the Arab position. France began renewing its relations with Algeria and other Arab states, further distancing itself from Israel. De Gaulle’s resignation in 1969 and his subsequent death in 1972 did not lead to any change in policies toward Israel. President Georges Pomidou endorsed a pro-Arab Middle East Policy. After his sudden death in 1974, Alain Poer, a longtime friend of the Jews, took over as acting president. Nevertheless, France still continued to become closer with the Arab states and did not intervene in the boycott of Jewish banks by Arab investors. Francois Mitterand’s presidential election in May 1981 brought hope of a favorable change in attitude toward Israel. These hopes were manifested in Mitterand visit to Israel in early 1982. In this visit, Mitterand expressed the need for a Palestinian state disappointing those who wanted to see stronger support for Israel. During the Lebanon War, France tried to pass a UN resolution pressuring Israel into accepting a cease-fire and not entering Beirut; the UN resolution was vetoed by the United States. Historically, France and Lebanon were close, since Lebanon used to be a French colony. In the 1990's, Mitterand sent forces to join the allies during the Gulf War. He also met with President Herzog in 1992 and established Maison France-Israel, located in the heart of France. Despite these positive developments, a questionnable friendship with Rene Bousquet, secretary general of the police in the Vichy government, who was assassinated in 1993, embittered many French Jews. Mitterand was replaced by Jacques Chirac as president in 1995. Chirac was the first head of state to address the Palestinian legislative council in 1996. He also supports a larger European role in the peace process, especially in mediating a peace agreement between Israel and Lebanon. Subsequent leaders have also sought to increase France's role in the region, and particularly in the negotiations between Israel and its neighbors, but the Israeli sense that France and other European countries side with the Palestinians has minimized their influence. Still, recent leaders, including Nicolas Sarkozy, and current president François Hollande have enjoyed good relations with Israel. Those ties werre tested in December 2014, however, when the French Parliament, following the examples set by Ireland, Britain, Spain, and Sweden, voted to unilaterally recognize “Palestine.” The French Parliament released a statement saying it hoped to use the recognition of a Palestinian state as a means of resolving the conflict with Israel” (Haaretz, December 2, 2014). This vote was condemned by former French Prime Minister Nicolas Sarkozy, who referred to the security of Israel as the “fight of his life.” Sarkozy expressed support for a two state solution and recognition of a Palestinian state eventually, but he told members of his UMP party that “unilateral recognition a few days after a deadly attack and when there is no peace process? No!” Sarkozy was referring to the deadly attack in which two Palestinian cousins Ghassan and Uday Abu Jamal entered the Kehilat Yaakov synagogue in Jerusalem during morning prayers and massacred five individuals with guns, knives, and axes. In response to the vote, Israeli Prime Minister Benjamin Netanyahu asked, “Do they have nothing better to do at a time of beheadings across the Middle East, including that of a French citizen?” (International Business Times, November 26, 2014). In light of these recent votes to recognize a Palestinian state, EU Foreign Policy Chief Federica Mogherini expressed doubts as to whether the movement to unilaterally recognize Palestine is beneficial to the peace process. Mogherini explained that “The recognition of the state and even the negotiations are not a goal in itself, the goal in itself is having a Palestinian state in place and having Israel living next to it.” She encouraged European countries to become actively involved and push for a jump start to the peace process, instead of simply recognizing the state of Palestine. Mogherini said that the correct steps to finding resolution to the Israeli-Palestinian conflict might involve Egypt, Jordan, and other Arab countries forming a regional initiative and putting their differences aside at the negotiation table. She warned her counterparts in the European Union about getting “trapped in the false illusion of us needing to take one side” and stated that the European Union “could not make a worse mistake” than pledging to recognize Palestine without a solid peace process in place (Bloomberg, November 26, 2014). French officials announced on January 29, 2016, that they would be spearheading an initiative to resolve the Israeli-Palestinian conflict, and pledged to recognize the independent state of Palestine if their efforts were to fail. French Foreign Minister Laurent Fabius revealed preparation plans for an international conference “to preserve and make happen the two-state solution,” including American, European, and Arab partners. The French initiative to convene an international peace summit to solve the Israeli-Palestinian conflict was presented to Israeli diplomats on February 15, 2016. The French initiative includes a 3-step process: consulting with the parties involved, convening a meeting in Paris of the international negotiation support group including several countries wanting to jump-start the peace process, and finally the summit itself that will hopefully re-start negotiations between the Israelis and Palestinians. In contrast to the comments of Palestinian Authority Foreign Minister Riyad al-Maliki, who stated during a February visit to Japan that the Palestinians “will never go back and sit again in direct Israeli-Palestinian negotiations,” Palestinian Authority President Mahmoud Abbas said that he welcomed the French proposal. The proposal was scoffed at by Israeli Prime Minister Benjamin Netanyahu, who called the initiative “bizarre,” and maintained that bilateral negotiations between the Israelis and Palestinians was the only was to achieve lasting peace. French President Francois Hollande's presidential plane was upgraded with an Israeli-made defense system in late 2016. The system, developed by Elbit, uses thermal-imaging cameras to detect incoming missiles or other threats and targets them with a laser beam that disrupts their tracking systems. French pilots joined their peers from Israel, the United States, Germany, Italy, India, and Poland in June 2017 for the 2017 Blue Flag exercise, the largest aerial training exercise to ever take place in Israel. Israeli Prime Minister Netanyahu visited France on July 16, 2017, to mark 75 years since the mass deportation of French Jews to concentration camps. In addition to attending a ceremony in commemoration of the mass deportation, Netanyahu and French President Emmanuel Macron held a formal meeting at the Élysée Palace. The visit was a resounding success, despite criticisms and protests in the previous weeks. Pletzel: The heart of Jewish Paris is the Pletzel, a Yiddish name for the old 13th century Jewish quarter found in the Marais district. Despite all the expulsions, Jews managed to find loopholes in the ban, so there was never any time where Jews did not live in Paris. One of the oldest spots in the neighborhood is a 16th century building in the courtyard once called Hotel des Juif, located on rue Ferdinand Duval 20. It was one of the first places occupied by Jews from Alsace-Lorraine and Germany. The Art Nouveau synagogue, agoudas hakehilos, located on rue Pavee 10, is one of the most interesting buildings of the district, the Art Nouveau synagogue. Built in 1913 for Russian and Rumanian immigrants, the synagogue was designed by Hector Guimard, who is most famous for his designs used for Paris’s metro system. In the district, one can find the museum of the city of Paris, Musee Carnavalet, housed in the former home of Madame de Sevigne on rue de Sevigne 23. Two rooms in the museum are dedicated to Jewish personalities prominent in the city’s history, Rachel (a famous 19th century Jewish actress) and Marcel Proust. A two-minutes walk from the museum is Place de Vosges, a famous Parisian square, where some of the city’s early 17th century buildings can be found. The actress Rachel lived in apartment house nine. Victor Hugo lived at apartment number six and a modest second-floor synagogue can be found at apartment number 14. One block west is the magnificent rue des Tounelles synagogue. Built in 1870, the synagogue originally catered to an Ashkenazi population, however, after the influx of North African in the 1950's and 60's, it became Sephardic. In the heart of Pletzel is the Memorial to the Unknown Jewish Martyr (rue rue Geoffroy-l'Asnier). 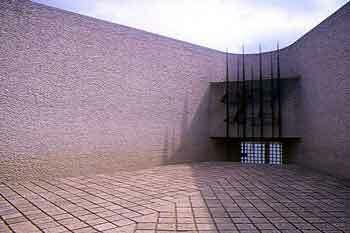 The memorial consists of a four-story building, inside the courtyard is a large bronze cylinder with the names of death camps inscribed on it. The crypt contains ashes from concentration camps, and the Warsaw Ghetto. Alongside the memorial is a stone wall with engraved Holocaust scenes. Inside the building is artwork, photo exhibits, a Holocaust documentation center and a library. Faubourg- Montmartre: Another Parisian quarter with many Jewish sites of interest is the Faubourg- Montmartre district. Within the district there are many synagogues, kosher restaurants and offices of various Jewish organizations. In the neighborhood’s center is the synagogue located on rue Buffault 28-30. The synagogue, opened in 1877, was the first synagogue in Paris to become Sephardic, adopting Portuguese rite in 1906. Next to the synagogue is a memorial plaque dedicated to the 12,000 Jewish Parisian children deported to Auschwitz. A second well-known synagogue in the district, is the Temple Victoire, located on rue de la Victoire 44; it is also known as the Rothschild synagogue. Opened in 1874, the synagogue has special seats located on the bimah for the chief rabbis of Paris and France. The rabbis leading the service still wear Napoleanic -era costumes. Located at number 42 rue des Saules, in Montmartre, is the French Museum of Jewish Art and History. Inside one can find Chagall lithographs, sketches by Mane-Katz and paintings by Alphonse Levy. Tombstones, ketubot, and Jewish ritual items can also be found in the museum. Also there is an exhibit of synagogue models from across Europe. Other districts: Jewish sites are not confined to these two main districts. 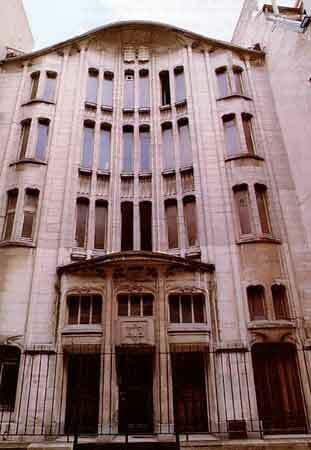 Near the Arc de Triomphe is the rue Copernic Synagogue, which houses the largest non-Orthodox congregation. The synagogue was the target of anti-Semitic attacks in 1980, killing 4 people. Built in 1906, the synagogue contains plaques for those who died in World War I and the 1980 bomb attack. 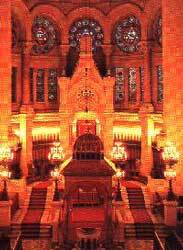 Another beautiful synagogue is located near the Eiffel Tower on rue Chasseloup-Laubat 14. Completed in 1913, the synagogue has a yellow-stone facade. It is attended by both North African Sephardim and Russian and German Ashkenazim. Close to the Seine, is the Theatre de la Ville de Paris, once the Theatre de Sarah Bernhardt. On the second floor of the theater is a room with her belongings, as well as memorabilia. Nearby is the Place de la Theatre Francaise, where Rachel made her debut in 1838. Inside the Louvre, are many items of Jewish interest, including the doors from the Tomb of Kings in Jerusalem, renaissance works with biblical themes, a 34-line Moabite language description from 824 describing a Moabite victory over Israel. Paintings by Jewish artists, such as Chaim Soutine, can be found at the L’Orangerie. Another interesting collection is the Strauss-Rothschild Collection found at the Cluny Museum. One of the most famous sites in Paris is Notre Dame. On both sides of the central portal are two female figures, one is Ecclesia and the other is Sinagoga. Ecclesia, a beautiful women, represent Christianity, while Sinagoga, a blind-folded women with a serpent around her eyes, represents Judaism. Behind Notre Dame, is square leading to a small Memorial to the Deported, dedicated to French victims of Nazism. Inside are the names of the German death camps where 200,000 French men, women and children were put to death. Above the door, in French, are the words: "Forgive, but do not forget." Two hours south of Paris is the city of Lyon, known for its culinary delights, as well as for its silk and fabrics. Lyon has more than 20 synagogues. Two of its most famous are the Grand Synagogue and Neve Shalom. The Grand Synagogue, located on quai Tilsitt 14, was built in 1864. Neve Shalom, is a beautiful Sephardic synagogue and community center. Lyon also has several kosher restaurants. Arles was once the Roman capital and a major medieval religious center. One site of Jewish interest is the Arlaten Museum, which contains local judaica. Former capitol of Normandy, a Jewish presence in Rouen dates back to the 11th century. During the 13th century, it was a city of historical and economic importance to the Jews. One of the most amazing sites in Rouen is a romanesque stone structure, dating back more than a thousand years and considered to be the oldest Jewish building in Europe. Inscribed on it in Hebrew are the phrases May the Torah Reign forever and This house is supreme. The structure is now located underground. Some theorize that this structure is a yeshiva from the Middle Ages, the only one of its kind to still standing. The Comtat Venaissin, which refers to the area including the cities of Carpentras, Avignon and Cavaillon, is a region that had a rich Jewish heritage. Jews lived in the south of France at relative peace until their expulsion in the 14th century when the region was united with the French Kingdom. The banished Jews, however, were granted refuge in the Comtat Venaissin and late came to be known as the Juifs du Pape, of the Pope's Jews. There are synagogues in Carpentras and Cavaillon that date back to the 18th century and are considered national monuments. A synagogue in Avignon, from this era did not survive but was completely rebuilt in 1846. In July 2013, the head of the Cavaillon tourism office applied for UNESCO World Heritage status to help preserve the Jewish ghettos, cemeteries and synagogues of the Comtat Venaissin. The synagogue in Carpentras, which is France's oldest active, was at one time the most emblematic places of Judaism in the region. Decorated in the Louis XV style, the edifice was built in 1367, extensively rebuilt in 1741-43 by the architect Antoine d’Allemand, and remodeled again soon thereafter. Vincent Kessel and Noémie Olive, “Enough! Thousands decry anti-Semitism in France after spike in attacks,” Reuters, (February 19, 2019).